We look forward to welcoming you all to the fully sold out great Knockma Duathlon in Belclare. Set on the iconic Knockma hill it comprises a trail run of 4.2k followed by a 20k bike and a 2.5k trail run to the finish. Registration opens at 7.30am, if you have a Triathlon Ireland race licence please bring it along, if not don’t worry. Registration will take place in Belclare GAA Pitch hall which is located off the N17 on the R333 53.490555, -8.921283. There will be STRICTLY NO PARKING at the start line so please cycle your bike from the registration area to the start line. Refreshments will be served at the GAA pitch after the race, so please come and enjoy the hospitality. A full race briefing will be sent out to athletes before the race. Registration Desk Closes 30.03.2019 9:15 Sharp! Transition Closes 30.03.2019 9:45 Sharp! on Saturday morning, 30th March 2019. Here you will pick up your Chip and Number, present. All competitors must sign on and a Triathlon Ireland One Day Licence is required. Tri Lakes are covering the cost of this. Could anyone who is already a Triathlon Ireland member please bring their TI number and id card. Note that you MUST present Photo ID at the registration desk. No Photo ID, no race. You must also present your Race Licence or a copy of confirmation from Triathlon Ireland that you have purchased your Race Licence for 2019 otherwise, a One Day Licence will be assigned to you. For Juniors, your Guardian must sign on with you so both you and your guardian will require Photo ID. It is your responsibility to show that you have an appropriate license and have correct identification. If you fail in either of these, we cannot let you race. Toilet facilities are available at Registration. Note that there are no toilet facilities available at the start/transition at Knockma so please make sure to avail of the facilities at Registration before you leave for Transition. Parking is available at Registration. There is no parking available at Transition at Knockma so we recommend you cycle over with a bag from Registration – its an easy 3k. Race License if you have one. On each section of the course, athletes will be counted. On the Run sections, a sweeper will run the course and on the Bike, we have a broom wagon should you find yourself in difficulty. We will endeavour to ensure your safety while participating in the Tri Lakes Knockma Duathlon, however you are first and foremost responsible for your own safety and are expected to ensure all of your gear and equipment is fit for purpose, that you observe the rules of the competition and the rules of the road and that you behave in a fair and responsible manner towards other competitors and towards yourself. On the run sections, these are predominantly trails and while they are well maintained and we will check for debris that could be problematic, they can have an uneven surface, they may be slippy and we therefore recommend trail shoes and caution, particularly on the descent. On the bike section, the roads are open and the normal rules of the road apply so be aware of your surroundings and other road users at all times. There are some potholes on the course which will be marked but do watch for uneven surfaces and water lying on the road that could cause you to lose you balance. Always maintain full control of your bike. Before entering transition, make sure your bike is road-worthy, that your wheels are secure, that your brakes are good and that your bar-ends are plugged. Also ensure that your helmet is in good order and fits securely. Remember this is a non-draft event, keep 10m between you and the rider in front. In transition, keep your gear and equipment tidy and make sure to take all bags to the bag drop to keep transition clear for yourself and other athletes. 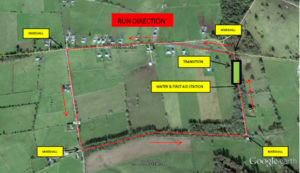 The transition is located at the carpark at the foot of Knockma and approximately 3km from Registration. The transition will Open at 8:30am on the morning of the 30th March 2019 and will Close at 9:45am sharp to facilitate the athlete briefing. Before presenting yourself at Transition, please make sure that you have visited Registration and picked up your Chip and Number. We cannot accept your bike into transition without your Chip and Number. You will receive a Bike Sticker at Registration, this must be put securely on your bike on the seat post or top tube. Also be sure to check that your bike is Roadworthy and that your wheels are secure, your brakes are working and that your handle bar ends are plugged. Please also have your Helmet fastened on your head when you present your bike. There is NO PARKING available at Knockma so you should park at Registration and cycle to Transition. You will be racking your bike as directed by the marshals in transition with even and odd numbers on either side. Your bike should be racked facing you with the saddle on the bar. One end of transition is the run entrance/exit, this is closest to the start and the other end is bike entrance/exit. The transition is one-way only! You MUST Enter and Exit Transition through the correct entry/exit and follow marshal instructions at all times. After the event when you are leaving Transition, your Bib number will be checked against your Bike number. If you have lost either or they don’t match, you will be asked to wait until everyone else has exited transition so please make sure you keep your bib number and that your bike number is securely attached to your bike. All bikes must be taken from transition before 1:00pm. In transitioning from the first run to the bike, make sure you put your Helmet on before removing your bike from the racking. DO NOT get on your bike in transition. Exit transition through the Bike Exit and only get on your bike when you have passed the Mount line. Follow the instructions of the marshals at all times. The bike course loops 20k around Knockma returning to Transition. The roads are not closed so you should be mindful of traffic on the route and you should at all times follow the rules of the road. On exiting Transition and mounting your bike AFTER the Mount line, you will take a left turn onto the main road. This turn will have a number of marshals to manage traffic, listen to their direction. 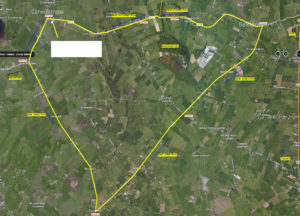 You will pass through Caherlistrane, past the GAA pitch and Queallys pub heading towards Headford. At approximately 5km where you see marshals at the junction, you will turn left heading towards Galway. At 9.8km you will again turn left when you see the marshals. This is a hard left and you will be descending from a small hill so make sure you break and control your speed into the corner so you don’t swing wide on your exit. 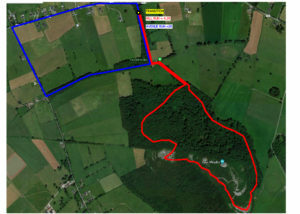 At 17.5km, you will again turn a hard left where you see the marshals, taking you into Belclare and back towards Knockma where you will turn left into Transition. You must Dismount your bike at the Dismount line before entering the transition through the bike entry. Directional signs will guide you on the Bike course and potholes etc will be marked with yellow paint. Be mindful of the road and other road users at all times. Tri Lakes Knockma Duathlon is a Non-Draft event. Drafting will be penalized according to Triathlon Ireland rules. All marshals including mobile marshals on the Bike course will be monitoring for drafting. As your approach Transition on your bike, you MUST Dismount at the Dismount line and enter Transition through the Bike Entry. DO NOT take off your helmet before you rack your bike. Make sure your bike and helmet/cycling shoes are left tidily so they don’t present a tripping hazard for other athletes. Exit transition through the Run Exit to start Run Two. Follow the instructions of the marshals at all times. The second run is around a loop at the base of Knockma. When you exit transition through the Run Exit, you will proceed to the main road and turn Left. You will run along the main road until you see the marshal and turn left. Keep into your left of the road as the roads are not closed. You will then take another left onto the trail back to the base of Knockma when you see the next marshal. This trail takes you to the White Cottage where you will again turn left for the final sprint down the avenue to the finish line where you started the day. The second run is 2.5km and its nearly all downhill! Once you cross the finish line to the cheers of the waiting crowd, please keep moving away from the finish line to allow space for those finishing behind you. You will need to return your chip – someone will be waiting to help you with this. There will be water and oranges available at the finish should you need to rehydrate. Refreshments will be available back at Belclare GAA Centre and our Prizes ceremony will take place there shortly after. Showers and changing facilities are also available at the Belclare GAA Centre. Remember to collect your bike and gear and to show your Bib number and Bike number when exiting Transition. Some aspects of the race will be different for Relays but except for those differences in this section, you can assume that the rest of the document applies to you too! At registration, both members of the relay team MUST sign on. One Race License or One Day License is sufficient for both team members. You will both need to show Photo ID. When you receive your numbers, the runner should use the Bib number and the cyclist should place the Bike number on their bike. Both members of the team need to enter transition at the same time and exit transition at the same time so that numbers can be checked. The Cyclist should make sure to stand out of the way of other athletes in transition and follow the instructions of marshals. When the runner enters transition, he/she will transfer the timing chip to the left ankle of the cyclist BEFORE they take their bike from the rack. As for everyone else, the cyclist should not touch their bike until their helmet is securely fastened on their head! The runner should then ensure they keep out of the way of other athletes while waiting for the cyclist to return and to follow the instructions of marshals. When the cyclist returns, they must rack their bike BEFORE putting the timing chip on the runner’s ankle for the second run.